This tool reviews video focuses on the Irwin XP (Extreme Pressure) clamp and our brief was to see how much stronger this clamp was than other similar clamps on the market. This tool is incredible! With very little pressure at all we were able to clamp, not just square timber but round pipes, odd shaped off cuts and pretty much anything that we needed to keep still! The adjustable jaws allowed the clamp to tighten round the most angular shapes giving complete control over the piece we were trying to work on. Another great feature about this set of clamps is the depth of the range. They start at 6 inches (150mm) then go to 12 inches (300mm) then 18 inches (450mm) then 24 inches (600mm) then 36 inches (1050mm) and finally a giant 50 inch version gives 1.250 metres of claming action. There is also a tiny little sliding foot on the bar of the clap which allows the clamp to be stood on the workbench while the piece of work can be dropped into it – very handy! This is a great feature as those who are regularly at a woodworking bench will know. 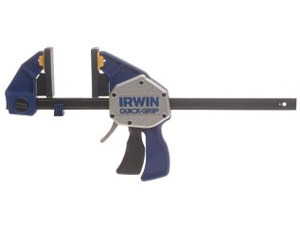 You can view further information and also purchase the Irwin XP Quick Grip Clamp from our DIY superstore. To find out more about carpentry, joinery and woodworking and all the DIY jobs that fall under this category why not check out our carpentry and joinery DIY how to projects area. This is a fantastic piece of kit! With a huge range of features and massive clamping pressure to match this is most definitely a must have in the tool kit. Once again a feature-packed and quality tool from Irwin which we are happy to give a deserved 5-star rating to.